Bespoke printed wine boxes are a great solution for your seasonal gifts. 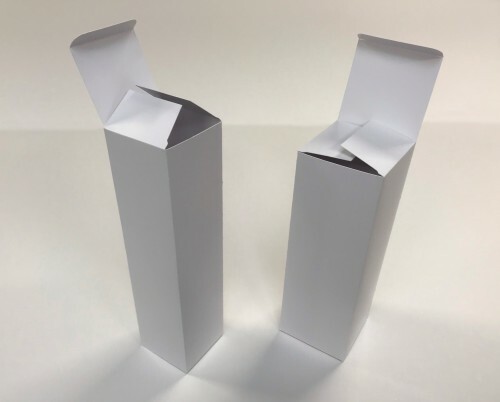 Available in two different sizes, supplied die-cut, and glued, ready to pop-up and use. Flexpress use a substantial 400gsm premium, environmentally friendly 'A' grade, triple coated or uncoated board. Both of which offer excellent properties for colour reproduction and holds fine detail well. All our Wine Boxes are printed individually using HP Indigo offset technology. You won't receive any products printed on beefed-up photocopiers from us - another reason we back everything with our total satisfaction guarantee. Laminating adds a thin protective layer of plastic to the surface of the card giving it a delightful texture whilst adding durability. Choose from a high-gloss laminate, a deliciously silky smooth matt laminate or the velvety peach-like texture of luxurious soft-touch laminate. Note: Laminate is always recommended for high-coverage designs. Our Wine Boxes are die-cut and creased on our Heidelberg S-Type Cylinder Die-Cutting machine.